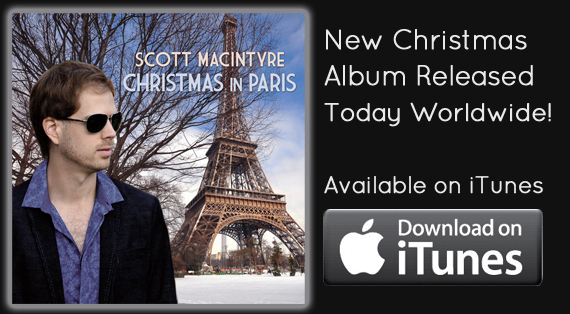 Scott’s new holiday album “Christmas in Paris” is now available on iTunes and in hard copy from CDBaby.com! Featuring fresh and unique arrangements of ten Christmas classics and two of Scott’s original songs, the album is filled with beautiful music that will warm your heart this holiday season. All the piano parts for the album were recorded on a Sauter 6’1″ Delta Wenge grand piano, and Scott’s vocals are delivered with an intimate and intentional passion like never before. Listen and order the physical album HERE or download the album from iTunes HERE. Amped Up Magazine - "AMERICAN IDOL’S SCOTT MACINTYRE RELEASES CHRISTMAS IN PARIS"